The trails (General Photos here) coursing through Wyalusing State Park offer photogenic views, bird watching, wildlife viewing, and nature study opportunities. The Sentinel Ridge Trail is wonderful for history buffs; ancient effigies are interpreted along this half-hour walk. 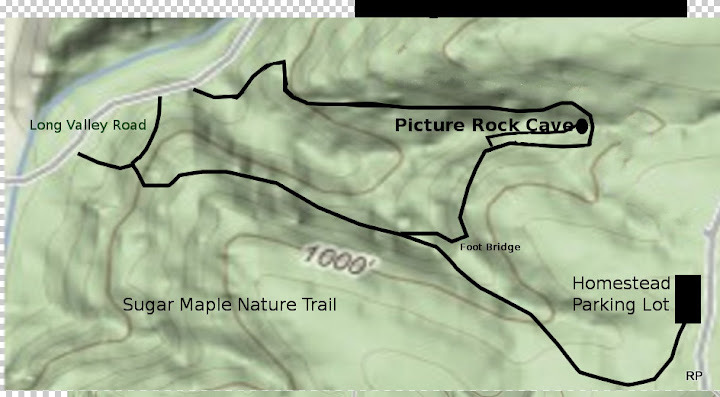 View caves along Sugar Maple and Sand Cave trails. There are two trails for mountain bikers: Whitetail Meadows and Mississippi Ridge trails. Mississippi Ridge along with Sugar Maple invites cross-country skiers in winter. Bikes are also permitted on park roads. Snowshoeing is a popular activity in the winter. Wyalusing State Park is mostly a hands on sightseeing destination in Wisconsin, as the only real way to witness the surrounding sights is if you get out, walk around, and explore the area for yourself. The best sightseeing comes from either heading out on the hiking trails or taking the canoe trail. Wyalusing State Park offers just over 22 miles of hiking trails, 7 miles of biking trails, and just under a mile of a handicap accessible trail. 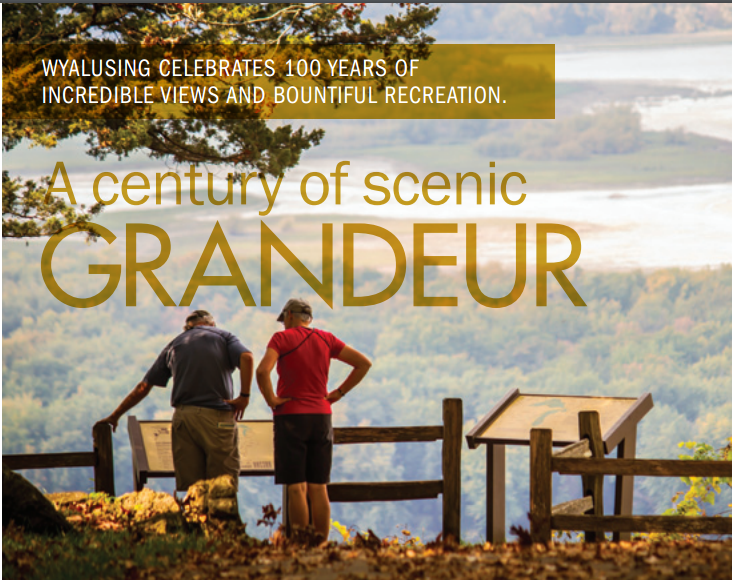 One of the most spectacular sightseeing views that Wyalusing State Park offers can be seen from Point Lookout, as this hiking destination offers magnificent views overlooking the Wisconsin and Mississippi Rivers about 500 feet below. As for the canoe trail, the park does offer canoe rentals if you don't bring your own. The map, above, shows the topography as well as color coding for each trail. 3.5 miles, 2 hours, Easy; few slopes. In summer it is open for bicycling. In winter it is used for cross-country skiing. Gently rolling trail that winds along heavily wooded ridge tops above the Mississippi River to the Mississippi View picnic area. During Winter, a closeby road, Cathedral Tree drive is not plowed. 1.6 miles, 1 1/2hours, Medium; becomes steep and rocky towards boat landing. Running from Point Lookout to the boat landing, this wooded trail turns the corner from the Wisconsin River to the Mississippi River. Midway along the trail is the Passenger Pigeon monument, many Indian mounds, and spectacular river viewpoints. Sentinel Ridge Trail is one of the most scenic trails at Wyalusing State Park. It can be reached from Point Lookout or Pigeon Monument, and follows the bluff all the way down to the Mississippi River (a drop of about 500 feet). Indian mounds, nature labels, the Passenger Pigeon Monument and Green Cloud Picnic Shelter are on Sentinel Ridge Trail. An outstanding view of the confluence of the Mississippi and Wisconsin Rivers can be seen from the Green Cloud Picnic Area and the Passenger Pigeon Monument. 0.4 miles, 1/2 hour, Easy, surfaced with limestone screenings, fairly level. This is a self-guided, accessible trail along ridge top circling around several Indian Mounds. Interpretive panels take the visitor on a human history tour of the people that shaped the area. Begin at the Sentinel Ridge parking lot. 3.2 mile loop, 1 1/2 hours, Easy, but long; wide grassy, gentle slopes. Rolling through open fields, brush lands, oak forests, and a pine plantation, this trail is ideal for wildlife observation. Due to the wide range of plant life and varied topography, many species of plants and animals can be seen along the way including, if you're lucky, the elusive wild turkey. 2.6 miles, 2 hours, Medium; wide, mostly grass, some rocky areas, gentle slopes. This trail descends to an old logging road through a maple woods and along the side of a deep ravine. The trail crosses a small brook many times in the river bottom with its tall nettles and huge walnut trees. Near the park office, it goes out along the edge of a white pine plantation and opens out into a grassland. Its variety of geography, plant cover, and wildlife make it one of the most interesting trails. 1.7 or 3.2 miles, 1 hour or 1 1/2 hours, Easy; rolling and grassy. In summer it is open for bicycling. In winter it is groomed for cross-country skiing. Gently rolling trail that follows along the border between open meadows and woodlands. A good place to view turkeys, deer, and grassland songbirds. 1.5 mile Loop, 1 1/2 hours round trip, Medium, some slopes, steps, and steep areas, gentle slope downhill from road. This heavily-wooded trail features self-guided nature information signs identifying various plants and giving ecological principles. A short side-trail leads to Pictured Rock Cave which displays a small waterfall tumbling over a limestone outcropping. Half of the Sugar Nature Maple Nature Trail has been re-routed. The new section features a level walking bed cut into the hillside. The newer section goes above the water fall. This is a brand new trail leading to Big Sand Cave, Little Sand Cave as well as Black Thunder Point. With the exception of a short steep slope, the pathway is along a freshly groomed walkway with no more than a 3% grade. This will be Wyalusing State Park's newest trail, completed by December of 2009. The trail features a smooth walking bed, cut into the hillside. Winter views, without leaves offer wonderful views of Wisconsin River, down into Big Sand Cave, and the newest cave made accessible for park visitors; Little Sand Cave. On the way to Little Sand Cave keep an eye out for Wild Ginger. Look but don't pull it out. Take the walkway from Point Lookout (as you are looking at the confluence) to the right (North). Treasure Cave is on Bluff Trail just below Point Lookout. The paved bluff trail and steps lead down along the bluff, through a key hole - a natural bridge formed from limestone - to wooden steps leading to the cave. Adults can stand in the entrance of Treasure Cave which overlooks Prairie du Chien in the distance. A canoe trail through the river sloughs offers a unique way to see the waterfowl, aquatic plants, an diverse animal life of the river bottomlands. The trail begins and ends at the park boat landing. Canoes can be rented from the park concession during the camping season.